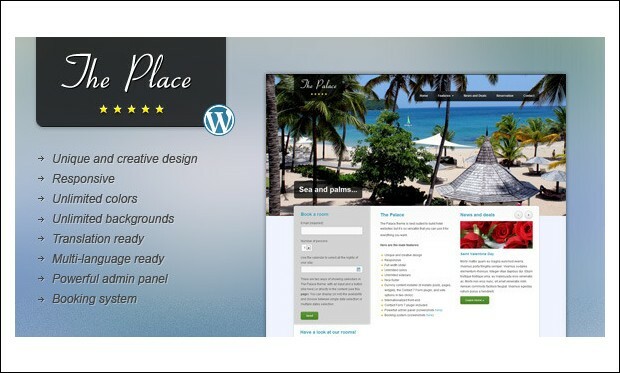 If you are in search of a best theme to incorporate accommodation or booking system for your hotel, restaurant, motel, guest house, bed and breakfasts, resorts, spa, salon, hospitality, health or medical websites then consider using the below listed WordPress themes. 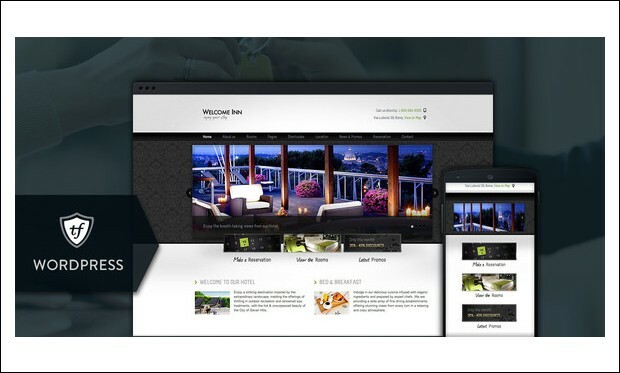 These premium WordPress themes comes loaded with a powerful online reservation or booking system to allow customers to book tables, rooms, holiday houses or apartments. They can even schedule an appointment with their dentists, doctors, professionals and other specialists based on the date and time availability in advance. Website owners can easily add or manage accommodations, bookings, ratings, reviews, opening and closing time, galleries and settings from WordPress admin area. Some of these themes also feature payment gateways to let customers pay for the rooms and other services that you might be offering to them. Here are the 30+ Accommodation and Booking Responsive WordPress Themes to convert visitors to potential customers. 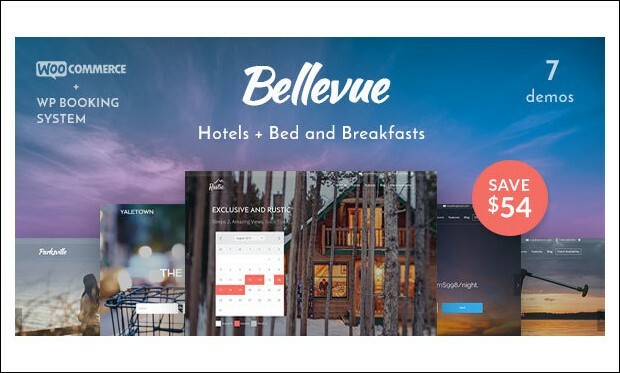 Bellevue is the minimal and perfect hotel booking wordpress theme for designing a powerful website for vacation rental or hotel that includes the booking system, events calendar and th easy payment options. It has all the advanced features for creating the powerful website. 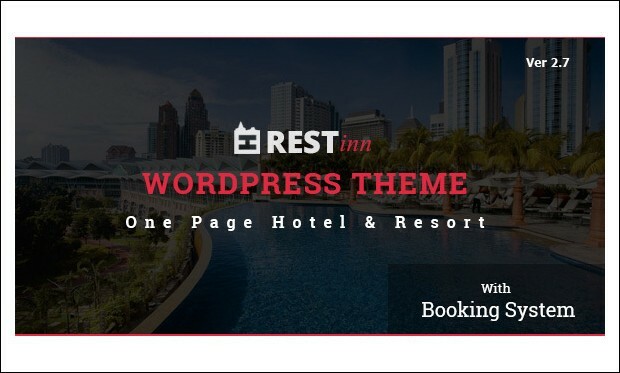 Restinn is the perfect accommodation and booking wordpress theme is designed for both the single branch hotels and multi-branch international hotels also. It is responsive and can be used effectively on any type of the devices like the PC, smart phones and Tablets. 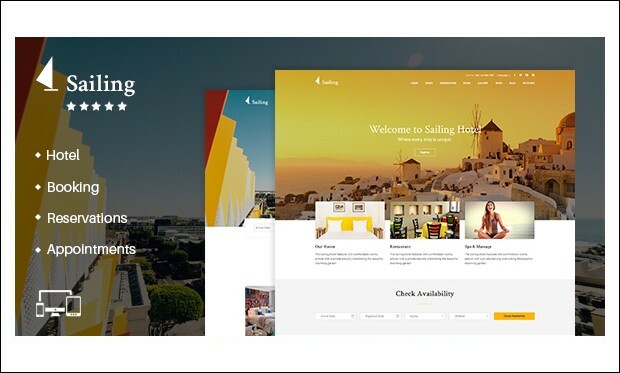 Sailing is the flexible WP theme for hotel reservation and booking of rooms in the hotel. 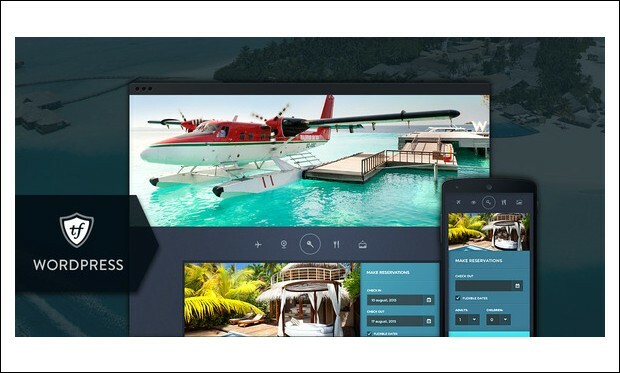 It has all the features that help in the easy running a hotel, resort or any other accommodation services using the excellent online reservation system. Paradise Cove is the fully functional and feature packed wordpress hotel theme for easy creation of the hotel management website. It is fully packed with the advanced features which help in the easy creation of the best booking and reservation website. As the name suggests, this theme is the master in easy designing of the stunning website for hotel bookings and reservations. 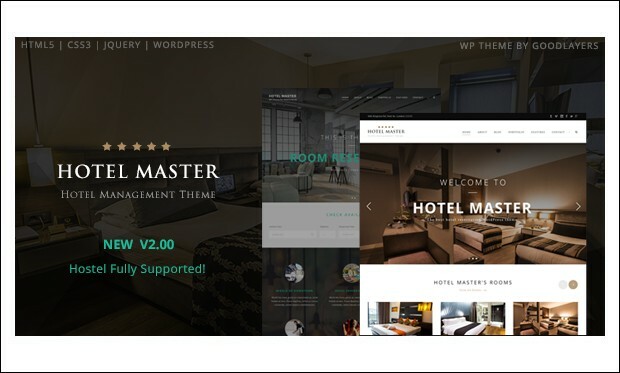 Hotel Master wordpress theme is exceptional and best theme as it has the best features packed in it and help in creating the best website. 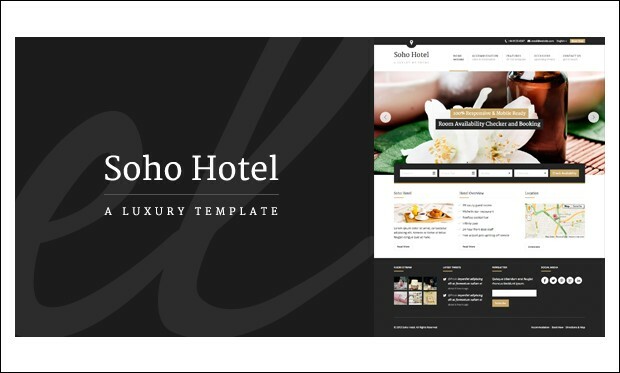 Soho Hotel is a beautiful WordPress theme especially designed for hotels, apartments, hostels and other accommodation related websites. It includes a fully functional booking plugin for adding room, managing new bookings, booking email id and booking settings. This theme also includes room availability checker for guests to check vacancy of the room and then make a reservation. It is fully responsive and translation ready. This clean and bold WordPress theme is designed keeping in mind the need to build hotels, bed and breakfast and accommodation websites. 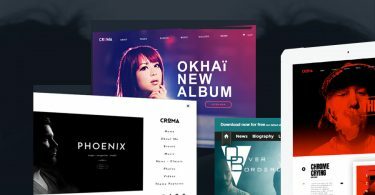 Get started with your own site by installing this theme that comes at a reasonable price. Important features of this theme are flex slider, availability, date picker, calendar, widget forecast tool, get map directions widget and full screen slider. 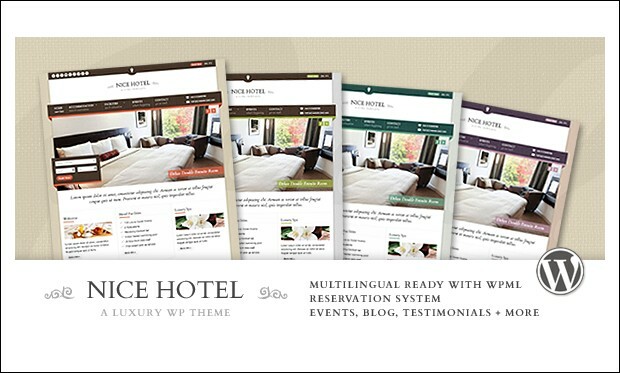 Nice Hotel is an elegant WordPress theme mainly designed for hotels, hostels, resorts, spas and other similar kind of websites. Accommodation management is a key feature of this theme to help you include descriptions and images of your rooms and services. Design your site by selecting from 4 predefined skins or create your own skin easily. It is tested to run well with the WPML plugin. It’s an attractive online booking WordPress theme suitable or booking portals, travel agencies, hotels, bed and breakfasts, guest houses, travel blog and villa websites. This theme is built with SEO best practices in mind for optimizing your site on various search engines. It allows you to set accommodation type, check in or check out, cancellation, star count, facilities, payment etc. 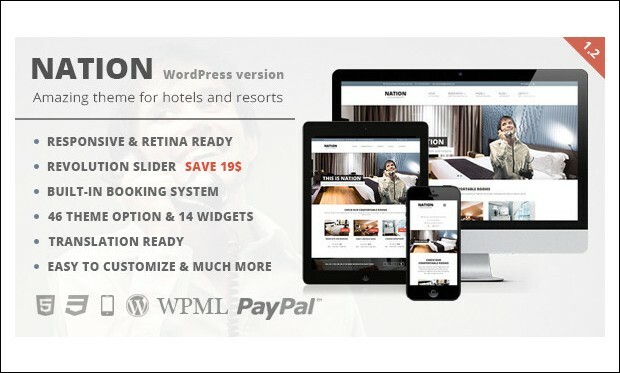 Nation Hotel is a clean and simple responsive WordPress theme that looks and works great on devices of various screen sizes from huge desktop computer to mobile gadget. It comes with a built-in booking system for managing booking requests, creating checkout form and setting up booking calendars. Customers can pay for the rooms or services through PayPal account or credit card. Paradise Cove WordPress theme is designed to impress visitors the minute they land on the website. 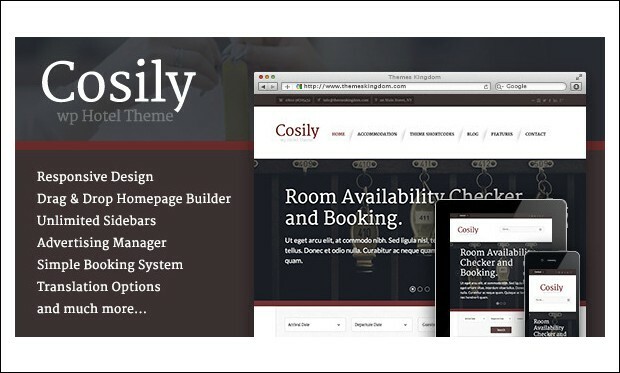 You can build an amazing hotel website by installing this theme at $53. Built on bootstrap framework, this theme features responsive and retina ready layout to let your site perfectly adapt to various screen sized devices. You can approve or reject the reservation requests that are directly sent to your WordPress admin. This WordPress theme is specifically designed for those owners who wish to create their own hotel, resort, villa and holiday apartment website. It features simple booking system to help customers book for a room in advance to the scheduled date. You can create unique homepages by simply dragging and dropping the controls via powerful page builder. Cosily theme is translation ready. 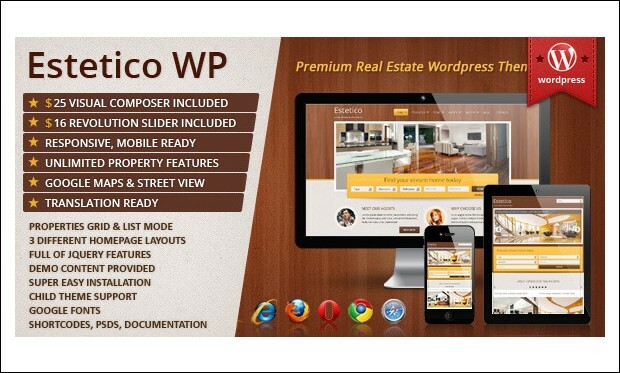 Estetico is an elegant and stunning real estate WordPress theme ideally meant for creating real estate, properties, rental and other accommodation websites. You can create mind-blowing slides by using revolution slider to grab visitor’s attention towards the site. You can easily setup and install the theme and if you encounter any issue then video tutorials and help files can come in handy. 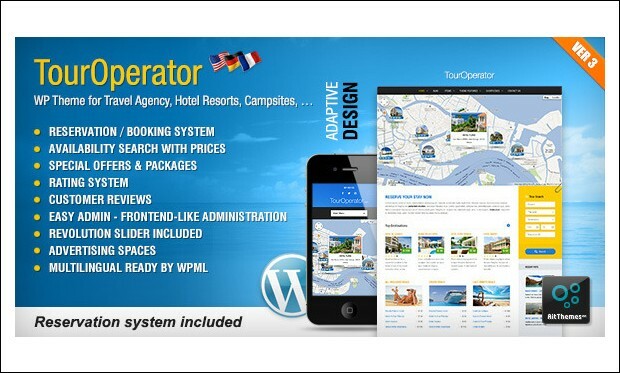 Tour Operator is one of the best WordPress themes with fully functional reservation system. 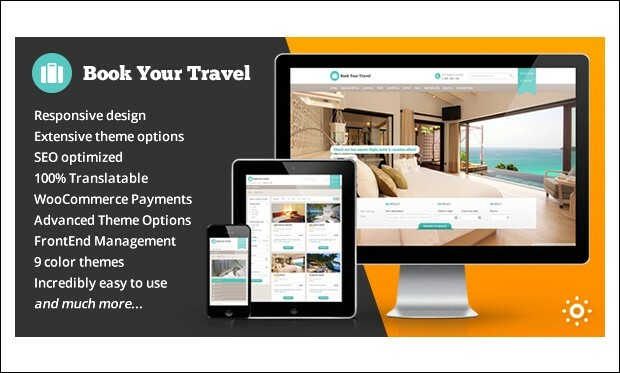 This theme works great for tour operator agency, hotel resorts, guesthouses, B&Bs and campsites. You can display property locations by adding Google maps onto the site. It is integrated with PayPal payment gateway for accepting payments online. It supports geolocation and includes interactive Ajax search. 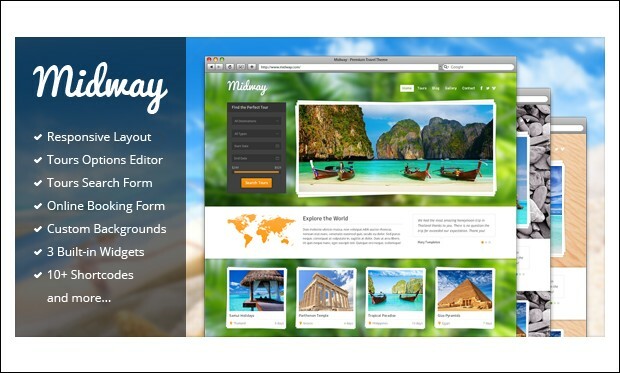 Midway is a responsive WordPress theme especially designed for travel business websites. With this theme, visitors can easily search and book tours. It includes 4 custom user forms such as search form, booking form, question form and contact form. Customize the theme by using powerful theme options panel. This theme comes integrated with Google analytics to help you track traffic sources. 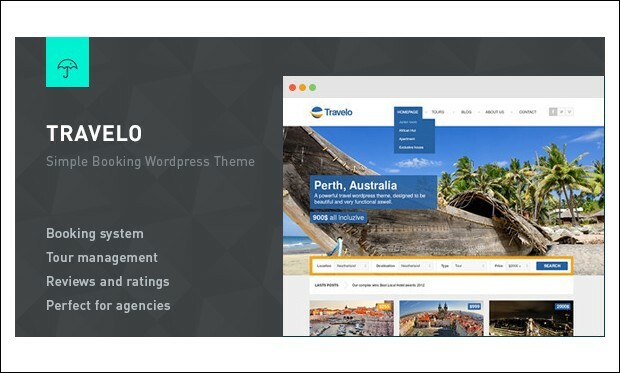 Travelo is an attractive booking WordPress theme designed for tourism purposes. It features booking system for small travel agencies without any payment gateway. This theme is equipped with .po and .mo files for translating the website to multiple languages. You can add any number of fields to the booking form via booking form builder. It is well documented to solve your queries. 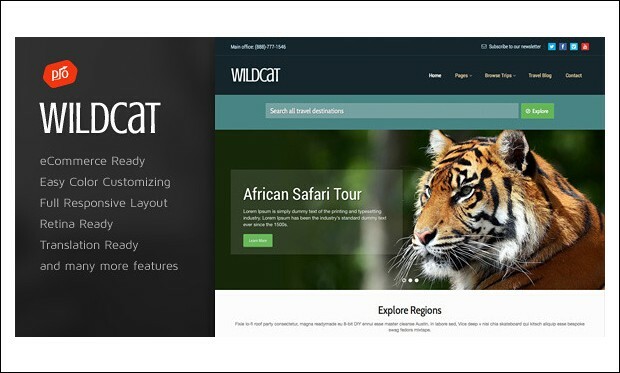 Wildcat is an amazing travel and booking WordPress theme from Theme Forest. You can quickly setup the theme by importing the XML demo files. It is built using HTML5 Boilerplate and lets you create numerous travel packages. 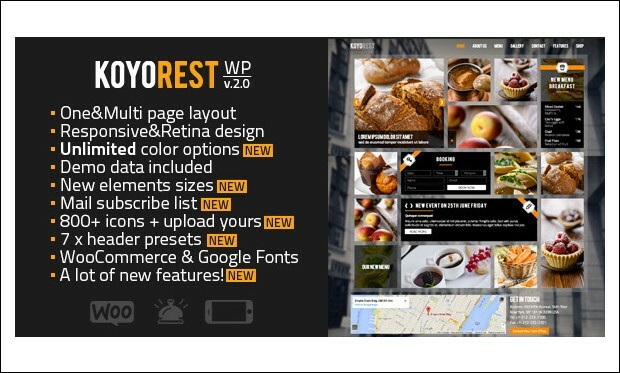 This fully responsive and retina ready theme looks fabulous on all mobile devices and tablets. It includes PSD Photoshop files for easy customization of the site. This WordPress theme is designed keeping in mind the need of beauty salons, hairdressers, wellness or spa to help them build their own website. It includes shortcode generator to enhance the functionality of your site. Customers can make appointments to book services by simply filling up the reservation form. 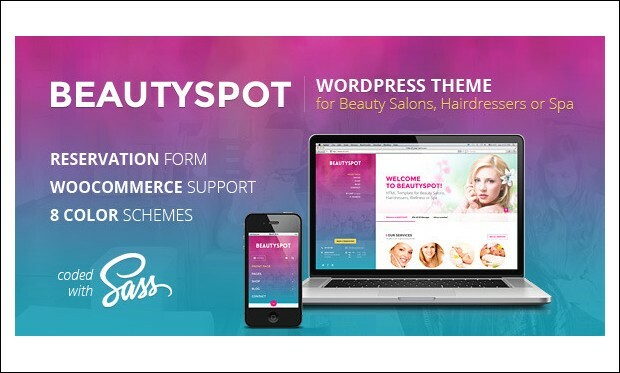 BeautySpot theme includes child theme and XML demo data. 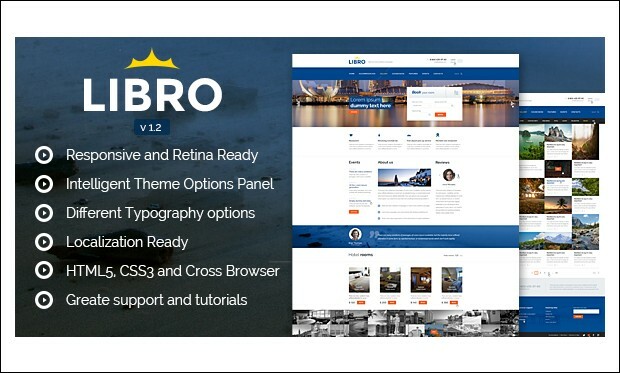 Libro WordPress theme is chiefly designed for creating a fully functional hotel and booking websites. This theme is developed keeping in mind the SEO best practices and compatible with popular SEO plugins. You can modify every aspect of the theme without any coding knowledge via theme optional panel. It is tested to work well with major web browsers like Chrome, Safari, Opera, Firefox and Internet Explorer. This elegant hotel WordPress theme can be used for building bed and breakfast, guesthouse, hotel, portfolio and corporate websites. It lets you chose from unlimited colours, custom backgrounds, custom headers and unlimited sidebars. The Place theme comes up with an efficient booking system to help you manage reservations. It is translation ready, multi language ready and works well with WPML, qTranslate, and Polylang plugins. It’s a one page and multi page WordPress theme well suited for cafes and restaurant websites. Due to its responsive and retina ready design, the theme looks sharp and pixel perfect on various screen resolutions. Koyorest theme comes equipped with a fully functional Ajax contact form as well as booking forms. 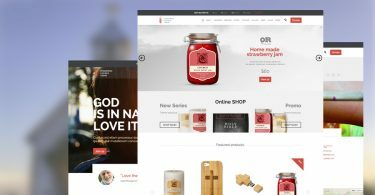 It supports WooCommerce integration into the site. 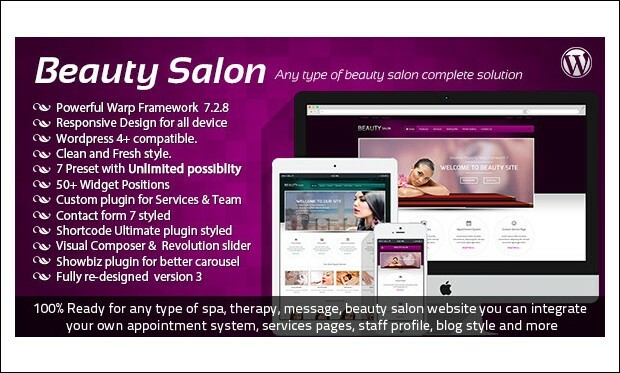 Beauty Salon WordPress theme is built on the powerful Warp framework and coded using HTML5 and CSS3 techniques. It includes visual composer for creating unique pages by dragging and dropping the interface. This theme allows you to create your own appointment system to enable visitors to book an appointment in prior to the scheduled date. It is cross browser compatible, translation and WPML ready. This responsive WordPress theme is designed to grab the visitor’s attention towards the site with its clean and attractive layout. 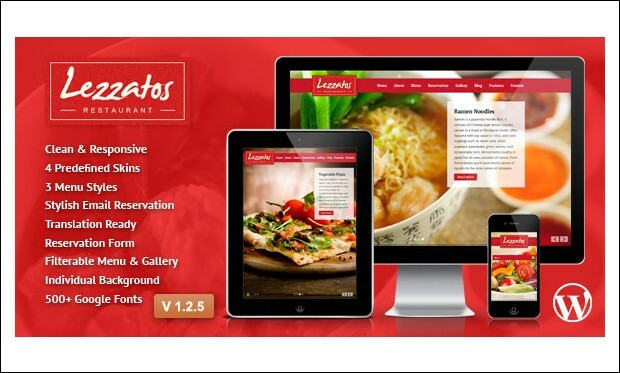 Install this theme at $48 and you can build cafe or restaurant website with ease. 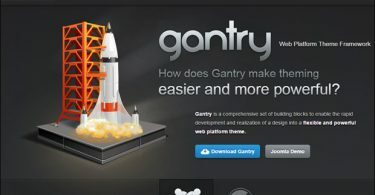 It comes equipped with 7 slider effects, 500+ Google fonts, shortcodes, full screen slider, contact form and many more. You can even set opening time and closing time for the reservation form. 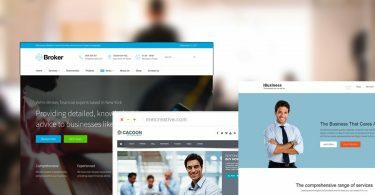 If you are in search of a best WordPress theme for your apartment, property or house then this theme can come in handy. This theme features a special booking form including agent contact form and availability calendar. It even comes integrated with optional PayPal for accepting payments. Apartment list page, top search, top booking, PSD files, shortcodes are some key features of this theme. Welcome Inn is a fully responsive and retina ready hotel WordPress theme that perfectly adjusts on various screen sized devices. This theme is designed to turn visitors to potential clients by allowing them to fill details directly on the online reservation form. It comes with built-in page layouts for room’s location, reservation, pricing etc. The theme is search engine optimized to improve website ranking. 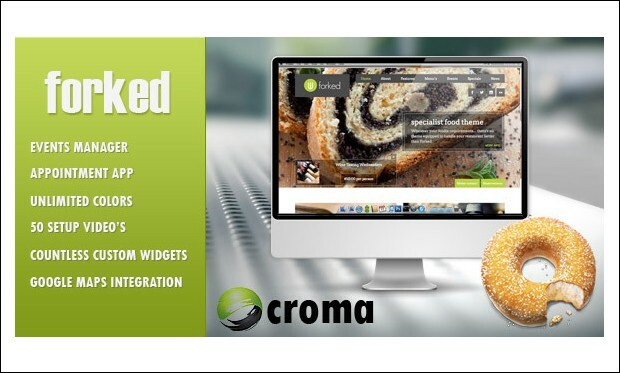 Built on Croma restaurants and events framework, Forked is an eye-catchy WordPress theme designed for restaurants, bistros, hotel, club, food trucks, breweries and other similar kind of websites. Table reservation or booking system is a unique feature of this theme. You can integrate Google maps onto the site to help customers easily track down your business location by providing driving directions. This clean and bright responsive WordPress theme is suitable for doctors, dentists, surgeons, health clinics, hospital and others involved in the medical practices. 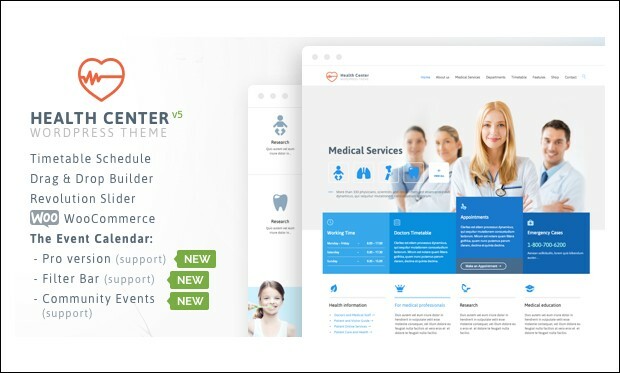 Health Medical Center is built on Vamtam Rock Solid theme framework and programmed with HTML5 and CSS3 techniques. Patients or customers can book an appointment with their doctors by using appointment/booking form. 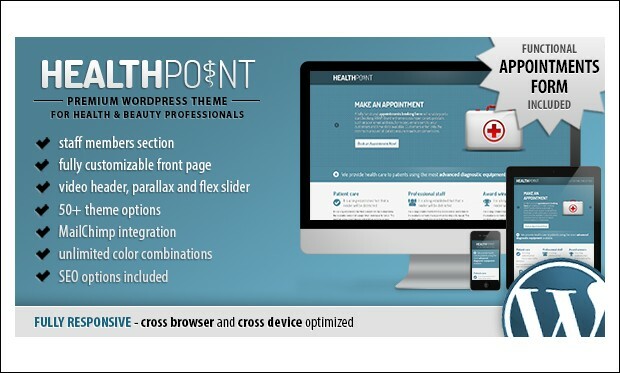 Health Point is a landing page WordPress theme specially designed for health and beauty professionals. It includes a fully functional appointment booking form to help visitors make an appointment in prior to the scheduled date. You can import the XML demo content including posts, pages, categories, images, widgets, menus and settings in one click. It is integrated with MailChimp newsletter subscription form. 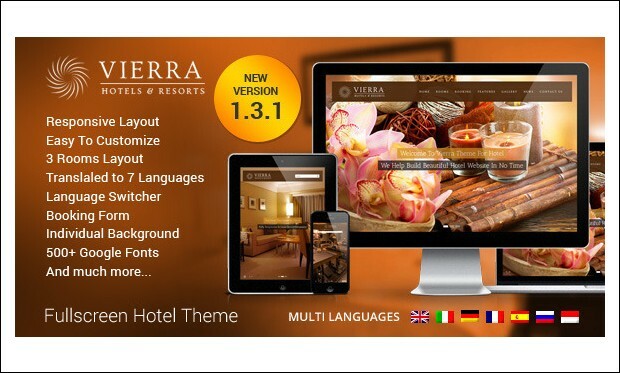 If you want to build an elegant website for your hotel business then Vierra WordPress theme would be the perfect choice for you to consider. Vierra theme is built on bootstrap 3 framework and comes equipped with a fully functional booking form for reservation purpose. By using advanced admin panel, you can customize the look and feel of the site in few clicks. This theme can be translated to 7 different languages. 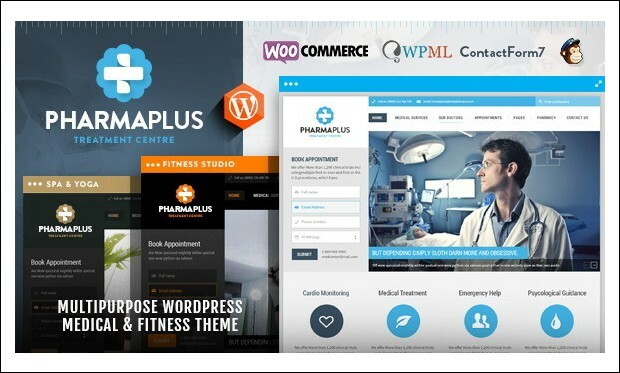 PharmaPlus is a feature rich medical and fitness WordPress theme from Theme Forest. Appointments booking form, opening hours, timetable, department, price table and price management are important features of this theme. 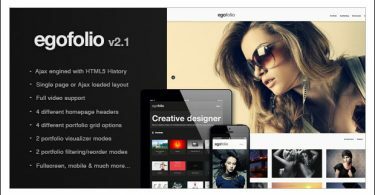 This theme is constructed with modern HTML5 and CSS3 technologies. You can manually take the back up of all the theme settings and options and restore them. It supports RTL languages. 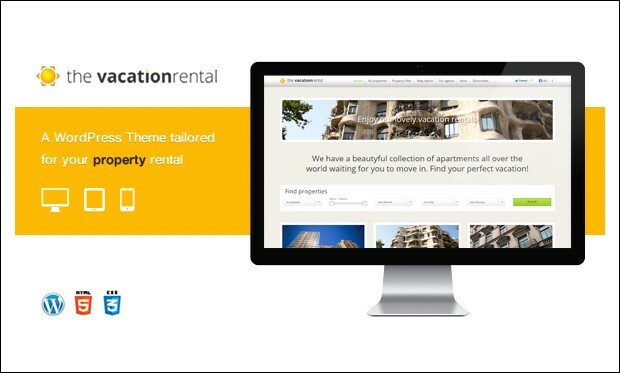 It’s clean yet attractive WordPress theme for building real estate property websites. 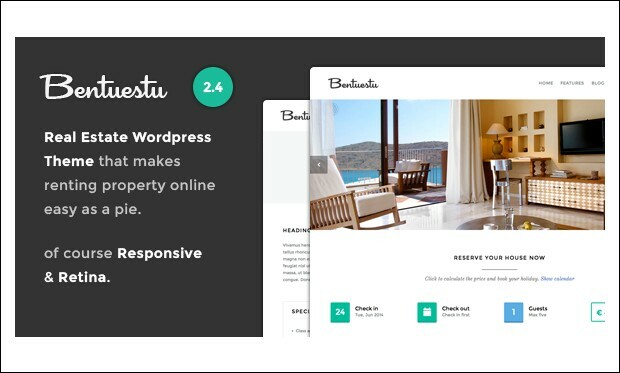 Bentuestu theme is based on Bootstrap 3.0 framework and features responsive and retina ready layout to make your site look awesome on all devices. 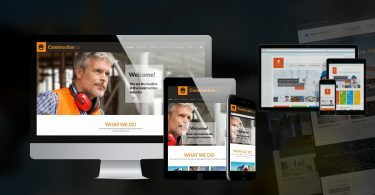 You can craft a beautiful full width responsive slider for inserting videos, content etc. Customers can check for the availability and book dates by using booking system.